Granny and I were invited to a friends last weekend. She is a wonderful Mum with 2 gorgeous girls and a son. Well,the girls were home on holidays and they decided to give us a High tea party. I thought I was in seveth heaven,with all those yummy cakes and scones plus can you see below a bowl of snakes. Yep,they are the kind of friends that I like. Afterwards we went out into their lovely garden and guess who hoped over to me. Two beautiful bunnies. Ginger Fluff and Cleo. Cleo was certainly getting very smoochy. Ginger Fluff was more interested in my shoes. Then we went down to the cook house to see if there was any eggs.There was one. I sat there and tried and tried to lay an egg but nothing happened. We had a lovely afternoon, with very special friends. 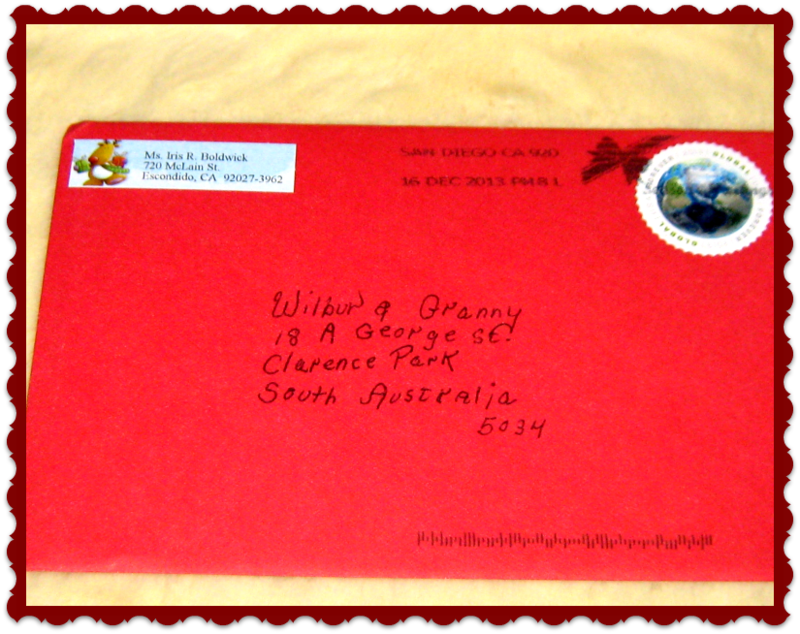 The postie gave me a letter this week. I think it must have been held up with all that snow in Canada. It is from all the bears at Honey Pot Lane. Thank you so much it just makes Christmas all the more special,to keep getting Christmas wishes. I go to bed every night with all my cards and I read them and think "How lucky am I to have such great friends. I tuck them under my pillow and hope I will dream about all my friends. I have just finished, my toast, peanut butter and honey. You are all invited to afternoon tea at Granny's place. 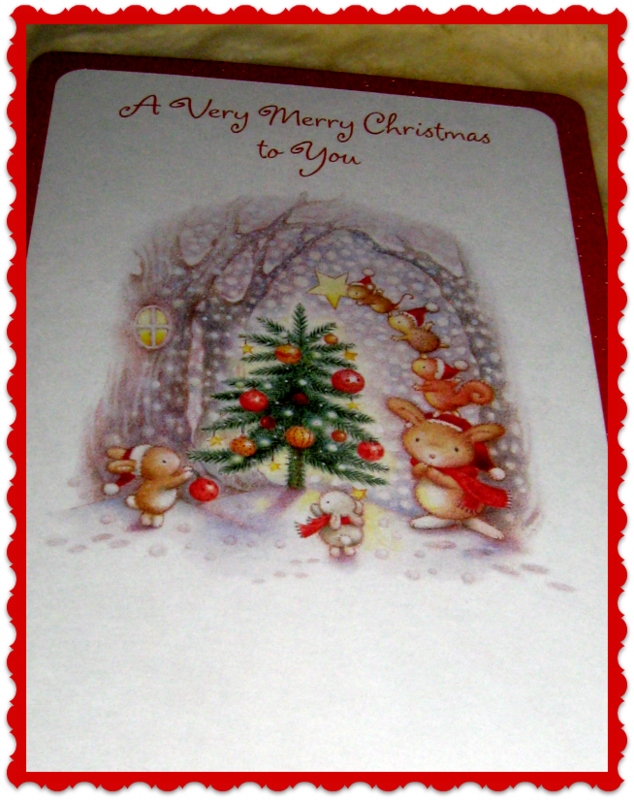 What a surprise, the last Christmas card of 2013 arrived! But don't worry, next Christmas will come and there will be more cards! Oh Granny Kay, those photos are adorable...we loved having you and Wilbur here with us for afternoon time, you are welcome any time...............hope there werent nibble marks on Wilburs shoes! What a bee-u-tee-ful tea party, the cakes look yummy, the snakes, we call them worms here in the USA. But I knew exactly what you meant. Well, if we could have a cup of coffee or cacao or honey milk instead of the tea we would like to come to your party, tasting all those yummy treats and helping you get rid off those snakes... *teehee* What a wonderful afternoon you've spent with your friends and making new friends - those bunnies really liked you. But somehow - who wouldn't like Wilbur??? das war ja ein schöner Tag für dich. Die Hasen waren wohl sehr verschmust und der Kuchen sieht auch sehr lecker aus. High Tea with friends ... what a special treat Wilbur. I can't understand why you couldn't lay an egg maybe you need more calcium in your diet. I hope Granny and you are keeping nice and cool during this heat-wave and drinking lots of iced tea. mysterious eggs, a christmas card in January from more friends, honey and milk... and with all you have your Granny who loves you so much too! Lucky you Wilbur! This all sounds like you are a really happy bear! Enjoy it! 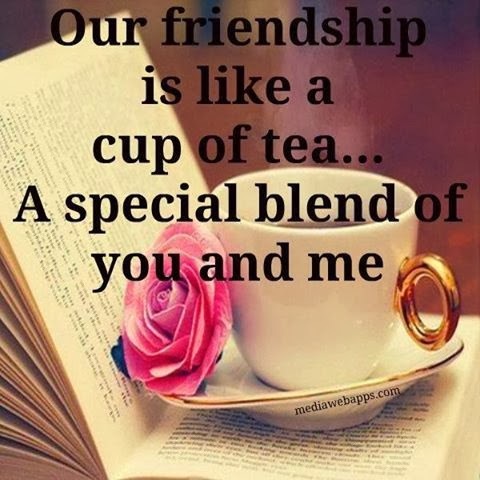 What a most endearing story you tell here and so true that friendship is like a cup of tea!